Edited by: Vincent Joseph Dooley, Samuel Norman Thomas Jr. 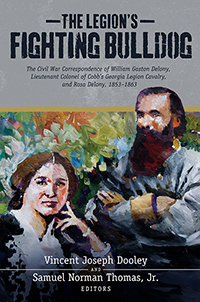 Greatly loved by those who served under him, Lieutenant Colonel William Gaston Delony possessed three admirable attributes: “commanding presence, bull dog courage, and superb generalship.” THE LEGION'S FIGHTING BULLDOG relays the story of a young man, on the cusp of a promising law career in the 1850s who comes to the conclusion that his way of life, and that of his neighbors, is about to change forever. Interwoven with those of his wife, Rosa Eugenia Huguenin, the Delony correspondence furnishes us a window into the lives of independent individuals during the Civil War who also happened to be well-placed in society due to birth. These writings give the reader insights into what soldiers thought and felt, and of what their families went through, both on the battlefield and at home. Delony doesn’t just write about his movements or the battles he has participated in—although he does a very good job of relaying information on that front—he also writes about the military and domestic activities taking place, as well as some of his innermost feelings. Delony expresses concern for his wife’s struggles with her pregnancy as well as his own woundings, even though he attempts to play down the latter. Rosa’s letters in response express her concerns for her husband and the wellbeing of their children. A graduate of the University of Georgia, Delony was well educated for the period. A lawyer prior to the war, his tremendous inherent tenacity and fighting ability made him the first Georgia Bulldog. There are many books about the Civil War era I treasure, but none more than THE LEGION'S FIGHTING BULLDOG. For sure, the letters of Will and Rosa Delony relate, in remarkable detail, the story of Cobb’s Legion in language that, at once, stirs the blood and touches the heart. Reading the letters, one feels their patriotic fervor at the outset of the war, Will’s horrid ordeal of fighting on the front lines, the equally painful and lonely trials of Rosa as wife and mother struggling to maintain home and children, and the disillusionment and then depression of Will and Rosa as they face the approaching reality that the world they loved was not going to last. The overarching story is not about the grim details of war, but of two noble and wonderful people, who are completely, and forever, in love with one another no matter the trials and tribulations. In an age where absolute devotion, fidelity, and commitment is so rarely eulogized, their tender letters, written as the world around them was disintegrating, are heartwarming and uplifting. I love this book and wholeheartedly recommend it to all who delight in great Civil War history and, moreover, in a real-life love story. This huge collection centers on the extraordinary correspondence between an Athens attorney-soldier and his wife. It highlights, as few previous works have done, the activities of Georgia soldiers in Lee's army, as well as tribulations ever present on the home front. Expertly annotated, with an easily flowing narrative, THE LEGION'S FIGHTING BULLDOG will hereafter be a basic reference tool for Georgia during its most traumatic years. The letters of W.G. Delony reveal the heart and heroism of a celebrated member of Cobb’s Legion serving in Robert E. Lee’s Army of Northern Virginia. Often in the thick of the fighting, the Georgian exhibited a fierce pride reflected in his views on friend and foe alike. Embracing letters from the Antebellum period to the end of Delony’s service in 1863, this compilation reveals the essence of life, love, and war in a turbulent era. Here is a book fully worthy of its protagonists--the passionate wife who concedes she’s as “restive and impatient as a young unbroken colt” and the tender-hearted husband whose fascination with danger keeps dragging him, with all his affections, back to the battlefield. More than a collection of great letters, THE LEGION'S FIGHTING BULLDOG is a stellar biography of the Delonys, immersing us in one of the most dramatic periods in our history. Congratulations, Gentle Reader. You have a genuine treat ahead of you. Whether you have bought, borrowed, or simply begun to browse this book, you are about to encounter two fascinating people.